A great sounding mono speaker with support for every major streaming protocol, but it’s a shame there’s no stereo pair option. 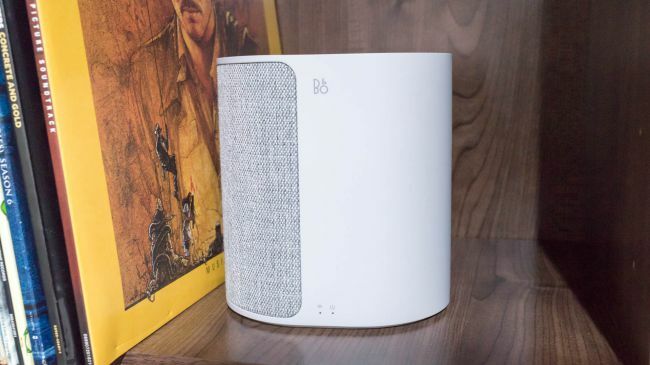 B&O has impressed with its range of wireless multiroom speakers, and the Beoplay M3 makes the line more affordable with the company’s cheapest model yet at $299 (£279 / around AU$390). As this is B&O, cheap doesn’t mean that the M3 is any less accomplished or feature-packed as it’s big brothers, and this speaker supporting every major multi-room streaming standard, not to mention Bluetooth. The B&O brand conjures up an image of refined design and quality build, and the M3 certainly doesn’t disappoint. Available in Black or Natural (that’s grey to you and me), you can pick the M3 that best fits your decor. You can also buy different front covers, so you can, for example, switch the material front for a more speaker-like aluminium front. Personally, we prefer the softer look of the material cover. B&O has gone for a minimalist look with the M3, with nothing to spoil the clean lines of the main body. Around the back are volume controls and a play/pause button. The latter will automatically reconnect to the last played source so that you can continue to play music quickly. While hiding the buttons at the back keep the M3 looking neat from the front, they’re a little fiddly to reach, and we prefer Sonos’ top placement. A flap underneath lifts up to reveal the power and 3.5mm audio inputs. There’s also a standby button under here, although it’s such a pain to reach that you’re unlikely to use it often. You get built-in Spotify Connect, Google Cast and AirPlay support as standard, so streaming music to the M3 is an absolute doddle. There’s also support for the Bang & Olufsen app for multi-room control. Google Cast support is particularly exciting, as you can easily create groups for multi-room playback. More importantly, if you’ve got Google Home or Google Home Mini, you can voice control your music playback. 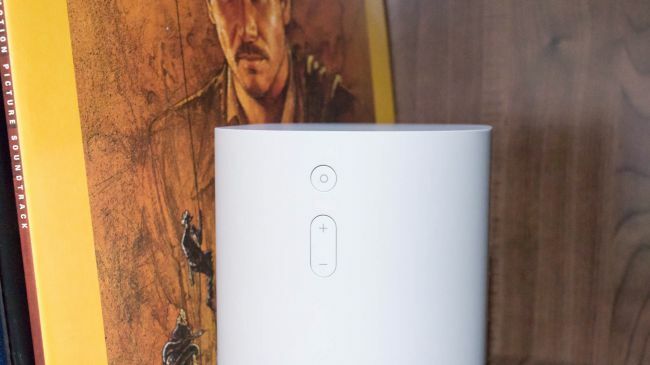 Neatly, when talking to a Google Home device, audio is temporarily lowered, so that the voice assistant can pick up your voice clearly. The downside of multi-room support is that you can’t play different Spotify tracks in different rooms; only the same track on multiple speakers. Sonos has the clear advantage here, as with one account you can play different tracks on different speakers. A flap underneath lifts up to reveal the power and 3.5mm audio inputs. There’s also a standby button. 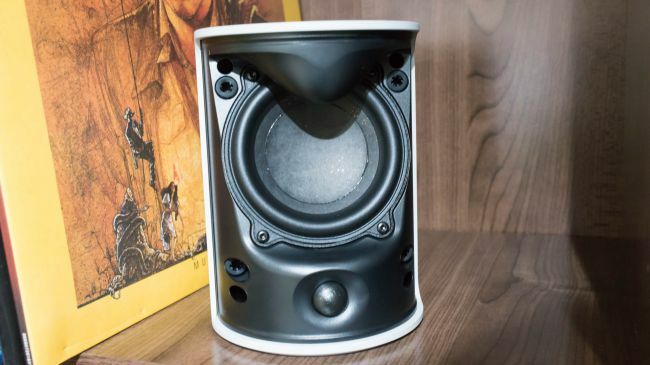 The M3 is powered by two 40W Class D amps are a 3.75-inch woofer and 0.75-inch tweeter. As a result, the M3 is a mono device; this makes sense for the size of package, as fitting stereo speakers would impact on sound quality. It’s a shame that there’s no support for wireless stereo pairing to join two Beoplay M3 speakers together; this is a trick that the Sonos Play:1 and Sonos One can do, boosting their audio prowess. 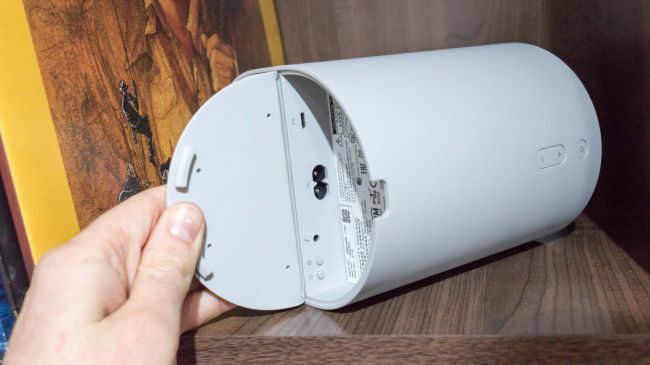 B&O has several profiles for the speaker, depending on whether you’ve placed the M3 in the middle of a shelf, in a corner, or have it wall-mounted via the speaker mount underneath. Also, the Tonetouch feature in the app lets you tweak audio further, getting the balance of bass and treble right for your listening preferences. We recommend trying the settings until you find the configuration that you’re happy with. Audio is quite directional, and we found that we had to carefully place and turn the M3 to get the perfect audio from our usual listening position. Once done, the M3 was capable of putting out some rather good sounds. Certainly, the M3 is capable of pushing room-filling audio with a fair amount of presence and attack. Bass is clear, defined and punchy, accentuating even the toughest of tracks and bringing them to life. Listening to John William’s Imperial March, the track had it’s full impact and menace. Even bass-heavy tracks, such as OK Go’s This Too Shall Pass, are handled well without distortion. Bass is arguably better at low to mid volumes; at higher volumes, low-frequency sounds are clearly reduced to prevent distortion. As a result, we’d recommend the M3 for smaller rooms, where you don’t need the volume so high. High frequency sounds come out well, with clarity and subtly. Listen to something classical, such as Debussy’s Claire De Lune, and the gentleness of the piano is clear to hear. Clear and engaging vocals are handled well throughout, too, and the Beoplay M3 gets the balance just right. If anything, the mid-range gets a little compressed and some of the subtly of tracks can get lost in the mix. As a mono-only speaker, there are some limitations with some tracks. Listen to the sweeping intro to the Foo Fighter’s Enough Space, and the track feels somewhat confined and localised; with a stereo system, this track usually swirls and whips around you. Even tracks that use stereo more subtly, such a Pink Floyd’s Wish You Were Here sound a little tight and lose a bit of expansiveness. Sadly, the Beoplay M3 doesn’t currently support being used as a stereo pair. Two M3’s working together would sound fantastic. B&O told us that it is working on an update for stereo pairing, but they weren’t able to share a launch date for this functionality with us at the time of writing. A smart-looking and powerful multi-room speaker, the Beoplay M3 suits the smaller room. Supporting every major wireless streaming protocol, the Beoplay M3 is also incredibly flexible, even giving you voice control via the Google Assistant. 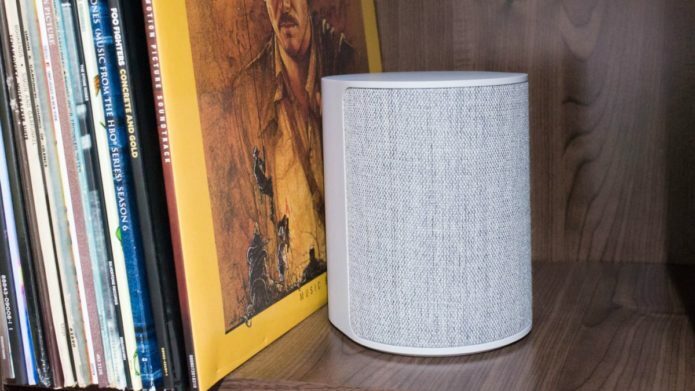 The main competition comes from the Sonos One, which has voice control via Alexa. Side-by-side, the Beoplay M3 is the higher-quality speaker, with marginally greater range and depth to its audio. However, the Play:1 can join a stereo pair, dramatically improving audio, and you can even add the excellent Sub for much better low-frequency audio. On top of that, the Play:1 is cheaper, and Sonos has better Spotify support. For most, then, the Play:1 (or even two) is a better choice.